We’re all familiar with the batteries that are used to start our vehicles. Just pop into your local automotive shop and they’ll tell you exactly which one is right for your vehicle. But when it comes time to find the best RV battery, the choice isn’t always so simple. The one that you install depends a lot on how much space you have, your budget, and your power needs. Fortunately, the choice doesn’t have to be hard. We’ll be taking a look at quite a few that are on the market. We’ll teach you how to determine your power needs, and set up an electrical system that works for you. 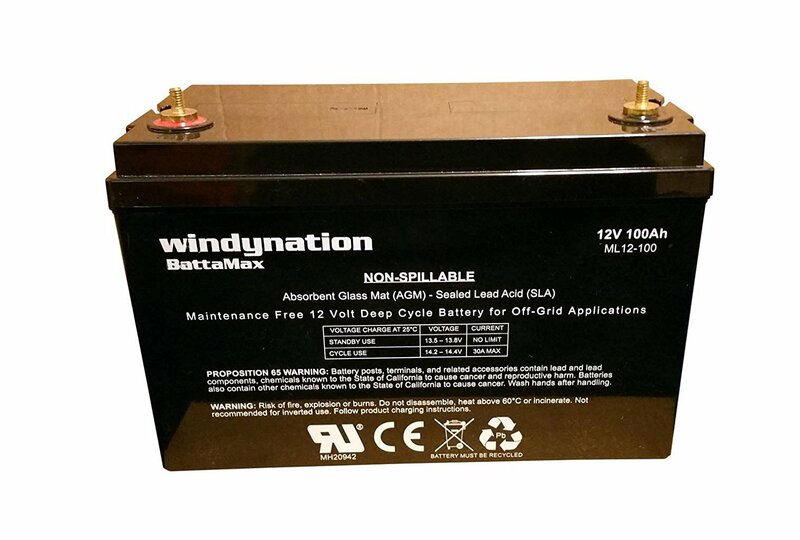 Most modern RVs and camper vans come with a battery, or a battery bank installed. These cells are used to power all of the 12 volt electronics such as you water pump, the lighting, or even an inverter to run your 120V equipment. With a properly equipped bank you can enjoy all the modern comforts of life such as hot showers and television. While they look very similar to a standard car battery, there are very different in design. Car batteries are measured in CCA or cold cranking amps. They’re designed to put out a very large amount of current for a very short period of time. This is why leaving a phone charger plugged into your cigarette lighter can occasionally kill a good battery. When they’re under low current draw, the performance is underwhelming. 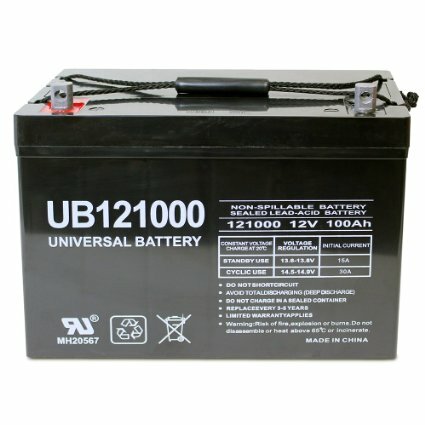 RV batteries are what’s known as deep cycle batteries. Their plates are much closer together, allowing them to support low current draw. There are three types you can choose from. You can use absorbent glass matt batteries, which are the most expensive but more reliable type. The most popular option is sealed lead acid batteries. These types use the same chemical formula as car batteries, but come in a pressurized and sealed container that prevents dangerous fumes from escaping and can be stored anywhere you like. 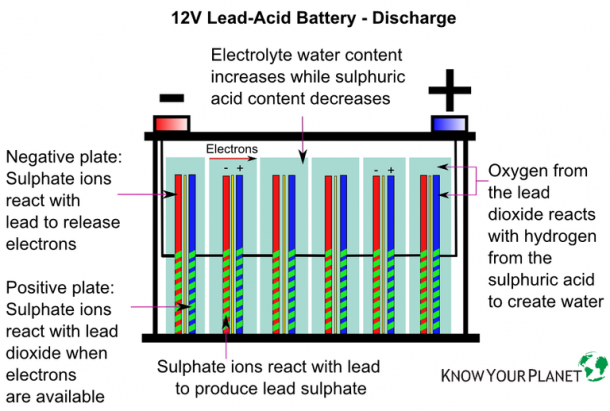 Finally, the DIY crowd commonly uses flooded lead acid batteries which offer superior performance to price ratio, but require additional setup and maintenance. So, just how much capacity do you need? The first thing you’ll want to do is make a list of all the hardware you’re going to be running. Generally, power draw is measured in watts. Watts is actually a factor of both voltage and current. We’re going to take the total wattage rating of each device we’re planning to run and use it to calculate our daily amp hour requirements so we can select the right one for our needs. For simplicities sake, let’s say we need a battery system to run a 50W water pump for 30 minutes per day, a 110W television for 2 hours per day, and a 10W of LED lighting for 7 hours per day. To calculate the current draw we just need to divide total power consumption by voltage. Since all RVs run on 12V systems, we just divide by 12. So the TV requires 9.1 amps, the lighting 0.8 amps, and the pump 4.1 amps. We’re not quite done yet. The last thing to do is convert amps into amp hours. This is very simple. An amp hour just means 1 amp of current draw for 1 hour. Running a 9.1 amp television for 2 hours requires 18.2 amp hours of battery capacity. Totaling everything up, we can see that we need 25.85 amp hours per day. Generally, it’s not a great idea to run deep cycle cells until they are completely flat. If you only use the top 50% of your cell capacity, they’ll last up to 10 times longer. If you required 100 amp hours every day, using a 200 amp hour battery system would last much longer. You also need to consider how long you will be away from shore power. Our 25 amp hour requirement is only for one day. If we’re didn’t have any solar panels and wanted to be able to camp for 3 days without a recharge, we’d then require 75 amp hours of life. Now that we know how much capacity we need, let’s take a look at what options we have. All deep cycle batteries sold today are technically lead acid batteries. AGM batteries are often sold as deep cycle marine batteries. The difference between these ones and others is that they use an absorbent glass matt to hold any unused electrolyte. This means that they don’t leak dangerous fumes, and can withstand hot and cold temperatures. This is ideal for RV applications for a few reasons. You can store them in any direction you like, without worrying about spills. Even if you’re doing some winter camping or storing them in the hot sun, these will be fine. Other types will suffer from extreme loss of power below 5 degrees Celsius and above 25. This battery has a 100-amp hour capacity. This means that it can supply 1 amp of current for 100 hours, or 50 amps for two hours, and so on. Not sure how much current you need? Amperage is equal to the total power (watts) divided by the voltage (volts.) A typical LED lighting system draws 2 amps, while a cellphone charger draws about 0.8 amps. Televisions or laptops require about 5 amps to run, while high powered electronics like electric heaters require 40 amps. For low power applications, just one of these cells will do. But for high draw users, you might want to consider two, four, or even six of the batteries for a powerful bank that can run all of your devices for several days. With the top post connectivity system, connecting many of these cells is easy. Since they are 12 volts, you’ll want to connect them in parallel. This means that all the positive terminals are connected together, as with the negative terminals. Another thing to consider is how deep your cycles are going to be. A 100% cycle means that you are starting with the batteries completely full and running them until they are completely dead. With any lead acid battery, a 50% discharge cycle is ideal. If you were to store them fully charged, you could easily get 10 years of use by making sure that you never discharge them past 50%. But AGM batteries are much more durable than most, so you can potentially go as far as a 70% discharge cycle without damaging them. These batteries are typically used in alternative energy installations as battery backup systems. They’re the most compact model we’ve come across, making them an excellent choice for anyone who is tight on space. Generally, a battery box that is designed to hold 2 standard deep cycle batteries can hold three or maybe even four of these guys. This particular battery has a much wider range of supported currents. They can handle up to 1000A at a time, and as little as 0.5A without any change to the capacity. If you’re planning to buy a big bank of cells to power high current appliances, you’ll definitely want to consider this model. These batteries work best inside your RV. They don’t leak, require any maintenance beyond charging, or vent fumes. They do, however, have an ideal operating temperature. At 25 degrees Celsius, you’ll get superior performance out of them. You can go as low as 5 degrees without much degradation in the performance. Basically, any temperature that is comfortable to live in works well for the cells. If you’re planning to head out in the hot summer heat or do a little winter cross country skiing, an external battery compartment would likely be so hot or so cold that it would negatively impact the performance. But as long as you keep them happy, these are batteries that can serve you for many years. They’ve got a 10-year float life. Most batteries severely discharge, and even break when they are not used for a long time. Even the three months you’ve got your RV parked can damage some types of batteries. But these ones are designed to sit for a long time without losing capacity, making them perfectly suited for the RV lifestyle. For anyone setting up an off-grid solar system, the brand name “Trojan” has reached an almost legendary status. 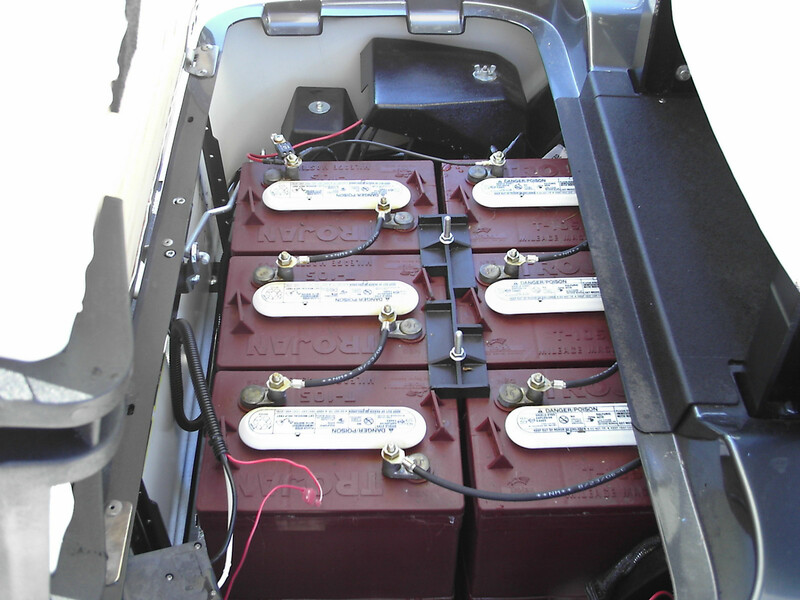 Typically, deep cycle batteries need a proper discharge and recharge cycle to keep them happy. They should be discharged to 50%, then fully recharged with a proper AC powered battery charger. But solar doesn’t always work that way. Sometimes, the sky is cloudy and you don’t produce as much power as you need. For these applications, Trojan developed a battery that was a little more flexible. Whether you’re using solar power or not, this is very good for RV users. If you’re from home for quite a while, you might not always have time to have them fully recharge. You also might not be discharging them as much as you should. This is a battery that is as flexible as you need it to be. There is a little maintenance required, but the work you put in will pay for itself many times over. The first thing to clarify is the capacity. For the price, 240 amp hours seems insane. But you need to remember that this is a six-volt battery. You’ll need two of them connected in series (on negative terminal connects to one positive terminal) in order to make 12V battery. That being said, four of these could run virtually anything you want. This makes them ideal for heavy electrical users, or anyone who wants to go full time in an RV. These batteries should be stored in a proper battery box. Many modern RVs have undercarriage mounted boxes, and these are ideal. Other options would be to a hitch mounted or roof mounted carrier. The only consideration is that you need to keep them above freezing. Many people mount them inside the living quarters of their RVs. When done properly, this is a great way to go about it. But when they are under heavy charge (going from 80% to 100% full) they tend to vent fumes. This means that they need to be vented outside of your living area. Many RVs already include ventured boxes, but if not you can pick up a vented box relatively cheap. All you’ll have to do is then run a small half inch piece of hose from the vent on the box to any air outlet on your RV. If you’re only using them on the weekend, many people just install the batteries and take them out to charge. In this case, you won’t need to vent at all. For the price, you’re not going to find a more reliable set of batteries on the market. Many people have been using the same set for upwards of 5 years with almost no degradation in performance. Your RV will help you run them down, but you’re going to need a way to charge them back up. Most people connect directly to AC to charge them. But if you want your batteries to last a long time, you’ll want to get a special charger designed for these batteries. The current top rated model is the NoCo Genius G15000. It has multiple stages that can charge you cells safely, and keep it in tip top shape. You’ll also want to make sure that you have the correct wiring in place. Any leads coming directly off your cell need to be rated for the maximum potential current. For most RVs, 4 AWG stranded copper wire should do it. Last but not least, you’ll want a battery box. Many RVs will already have this in place. But if you’re adding additional batteries to an existing system, or installing them were there weren’t any before, you’ll want to make sure you have the proper 12V battery box in place.